↑ 3.0 3.1 3.2 "Sue's vital statistics". Sue at the Field Museum. Field Museum of Natural History. สืบค้นเมื่อ 2007-09-15. ↑ "Museum unveils world's largest T-rex skull" (Press release). Montana State University. 2006-04-07. สืบค้นเมื่อ 2008-09-13. ↑ Jaffe, Eric (2006-07-01). "Sight for 'Saur Eyes: T. rex vision was among nature's best". Science News. 170 (1): 3. doi:10.2307/4017288. สืบค้นเมื่อ 2008-10-06. ↑ 31.0 31.1 Holtz, Thomas R., Jr. (2004). "Tyrannosauroidea". In David B. Weishampel, Peter Dodson and Halszka Osmólska. The dinosauria. Berkeley: University of California Press. pp. 111–136. ISBN 0-520-24209-2. ↑ Carpenter, Kenneth (1992). "Tyrannosaurids (Dinosauria) of Asia and North America". In Niall J. Mateer and Pei-ji Chen. Aspects of nonmarine Cretaceous geology. Beijing: China Ocean Press. ISBN 9787502714635. OCLC 28260578. 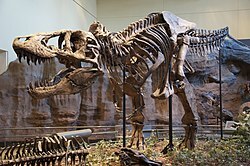 "The secret of T. rex's colossal size: a teenage growth spurt". The Guardian. 12 August 2004. หน้านี้แก้ไขล่าสุดเมื่อวันที่ 13 เมษายน 2562 เวลา 22:50 น.